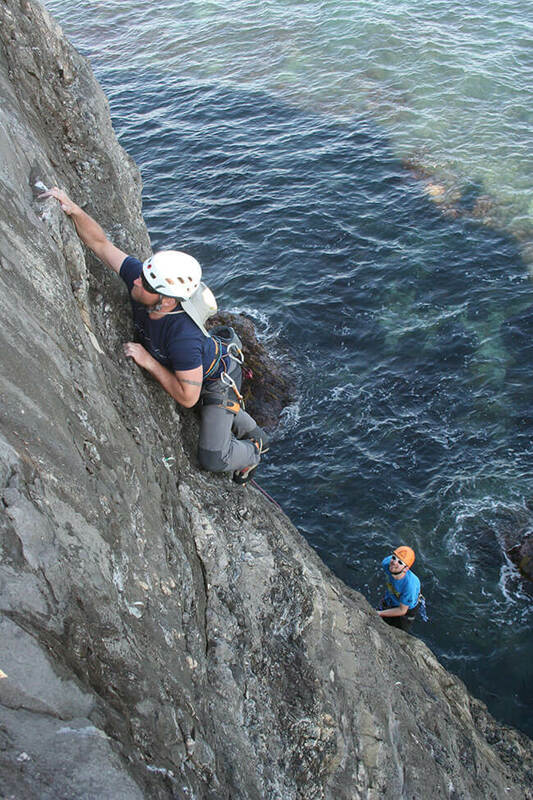 Rock climbing courses and adventures in the South West are our specialty. Locations in Devon, Cornwall and Dorset. 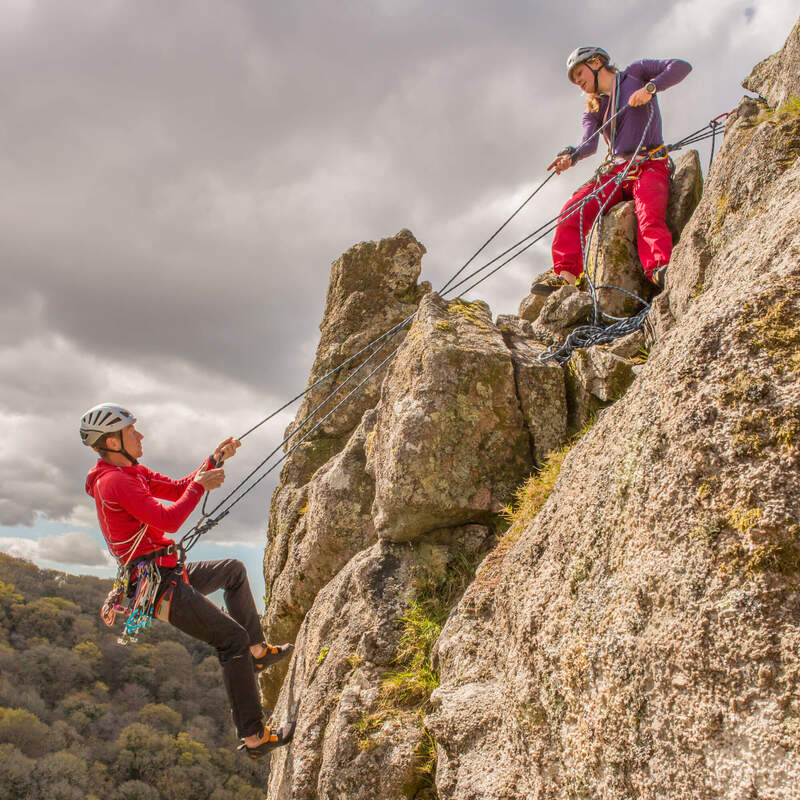 Whether you are a complete beginner or indoor climber looking to get outside, skills courses, private guiding, mountaineering and qualifications are all part of our offering. Everything that we do can be built around what you want. Below are some of our most popular climbing courses, but please get in touch with your own ideas and preferred dates. This is ideal for people who are new to climbing or indoor climbers looking to get outside. We will cover all the essential skills required to keep you safe as you progress with your climbing. Everything from safe belaying, knot tying and setting up climbs and abseiling. We have some really special venues for this in Dorset, Devon, Cornwall and the Wye valley. You will be well looked after by one of our experienced and qualified instructors. A single day course will be action packed and exciting but we also offer a two day course which will cover all the basics to enable you to venture out on your own. Contact us with the dates that you want. Have you ever dreamed of doing a particular climb? It could be Commando Ridge, Wrecker’s Slab, Moonraker, Cenotaph Corner, Devils Slide or Dream of White Horses. The list is endless but we can take you there. Many people booking these days come with tales of adventure and forced retreat but now simply want the stress taken away by one of our guides. Photographs of your day are all part of the package. Get in touch with your dream routes or leave it to us. 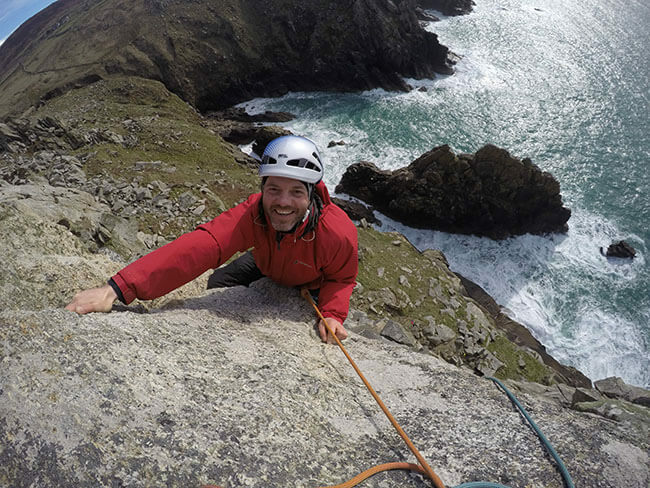 Our next Lundy climbing trip is on the 24-28 September 2019. Ferries, self catered accommodation and 5 days guided climbing all included. Contact us for further details. Bolt protected climbing is an excellent progression from climbing indoor, where you can focus on your climbing technique rather than worry about safety. These courses would normally be based on Portland in Dorset or the Wye valley where there is an enormous range of easily accessible climbing for all ages and abilities. We will cover all aspects of sport climbing, which will allow you to take your climbing further. 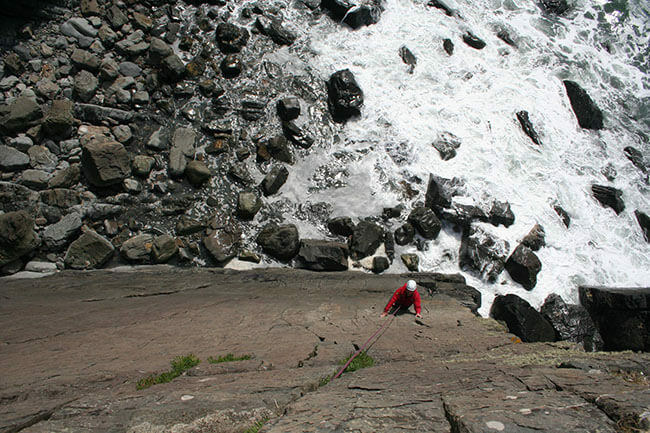 Lead climbing, performance coaching or just a fun day out above the sea. Top tips from our coaches will see your confidence grow throughout your course. This is for climbers with some experience of seconding trad climbs or indoor/sport lead climbers looking to branch out into the exciting world of traditional climbing. We have found some of the very best locations in Devon, Cornwall and Dorset in the South West for this but also offer this course in Snowdonia. We will cover everything from leader placed protection, building belays and stance management. Venues and course content will be discussed with you to ensure that your specific needs are met. One day refresher courses, two day intro lead climbing courses and 5 day development courses available. This is most suitable for climbers with some previous experience of outdoor climbing. The UK has some huge sea cliffs and mountain routes. Expanding your skills to tackle some of the additional challenges comes highly recommended. We will guide you through all the essential skills required to operate safely in this rewarding environment. Slick ropework and stance management will be a strong focus. Our favorite venues for this course are West Cornwall, Dewerstone, North Devon, Wye valley and Snowdonia but elsewhere by request. 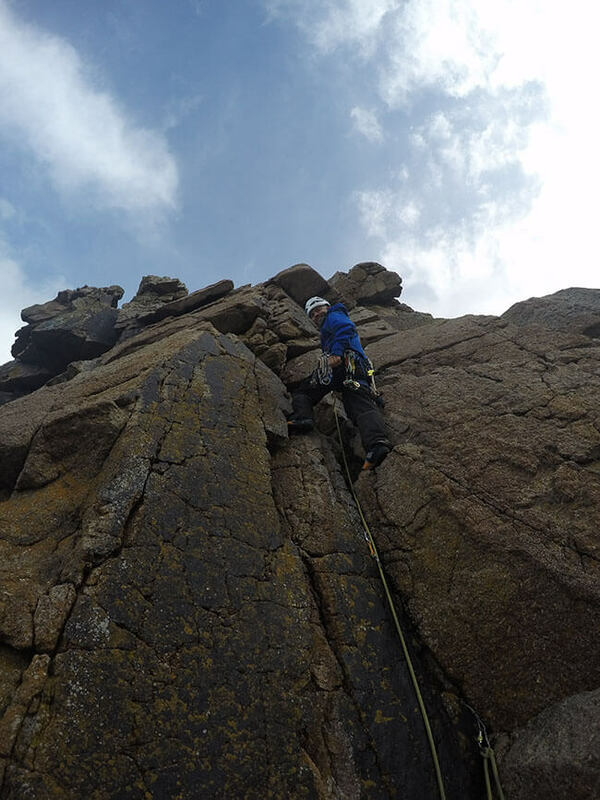 You may have attempted a climb that proved too difficult, a climber in your party could be injured, or you are forced to retreat back up your abseil line. Are you equipped to deal with these and other situations? 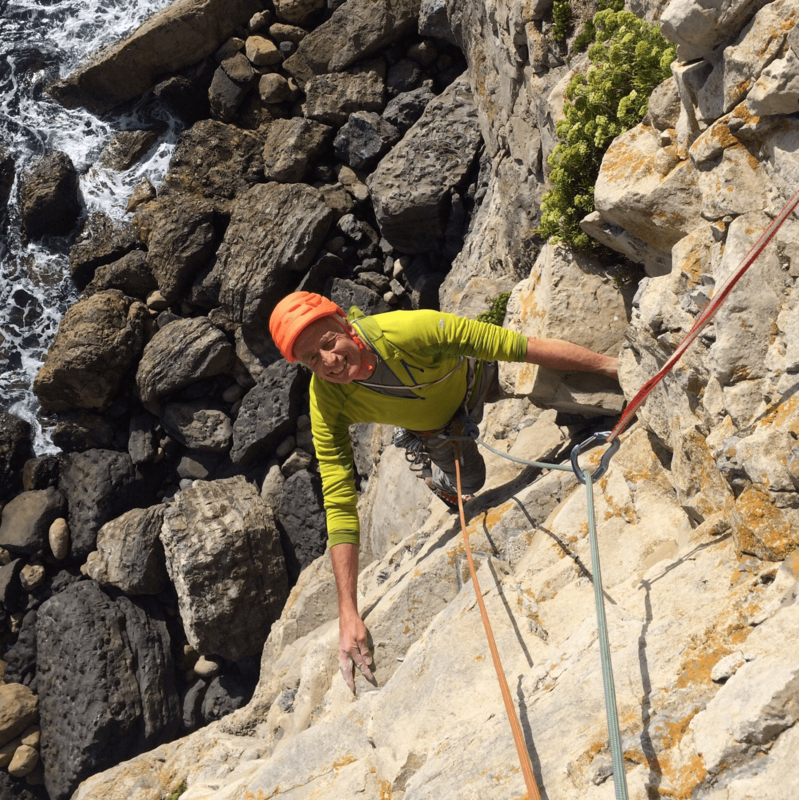 Sea cliffs and mountain crags are serious places, that require an appropriate “tool box” of skills to help you cope with unforeseen circumstances. We will give you the skills and confidence to operate safely in such an environment. 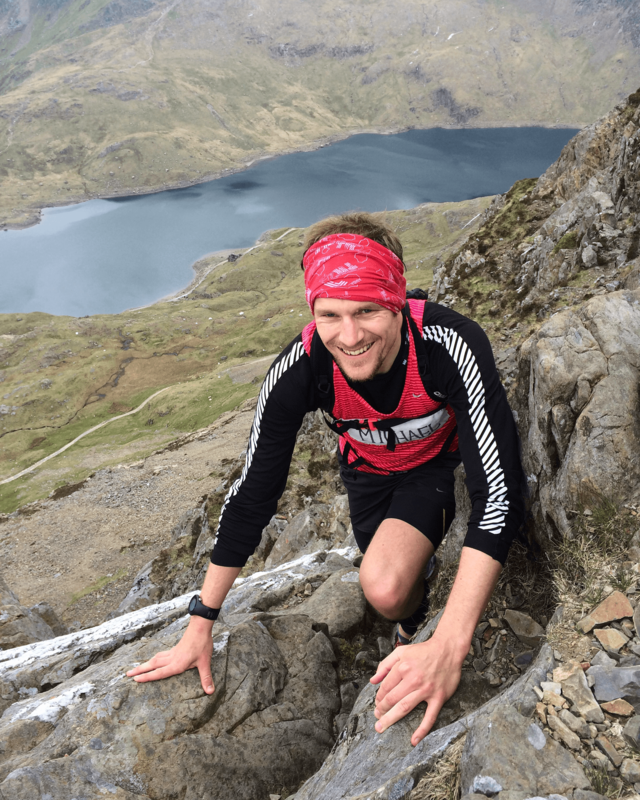 This is all about moving efficiently and safely in the mountains, whether its preparing for a UK Classic, such as Tower Ridge on Ben Nevis, the Cuillin Ridge or a trip to the Alps. This course will set you up well for success. Our courses would normally be based in North Wales, or on the Cornish Coast.  This course is ideal for climbers looking at getting into Moutaineering or Alpinism. This is perfect for mountain walkers wanting to get off the paths in search of adventure or Mountain Leaders looking to brush up on their skills or progress towards their Mountain Instructor Award. All courses will be tailored completely to your needs and at the best possible locations. Increase your confidence to leave the beaten track in search of adventure. 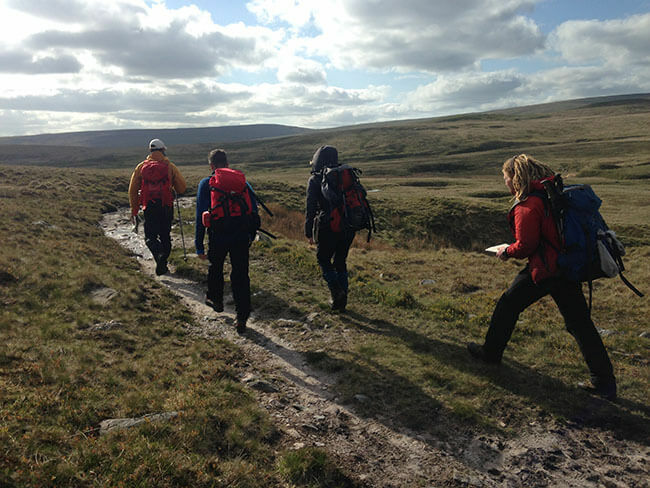 Specific training for DofE or Ten Tors groups. Poor visibility conditions or night navigation. Brush up on your skills before your Hill and Moorland Leader assessment, or Mountain Leader course. Skills honed on Dartmoor will prepare for any of the UK mountain regions. Other locations we offer are Brecon Beacons and Snowdonia but please ask if you have somewhere else in mind. We are also specialists in coaching navigating at speed, which is perfect for fell runners or would be orienteers. Tell us what you want to get out of your course and leave the rest to us. Our prices start from £70 per person / day (based on 1:4) and £184 for 1:1 coaching. Prices do vary based on numbers in group, location and course content. Please ask for details. The Mountain Leader scheme is designed for people who want to lead groups in the mountains, hills and moorlands of the UK and Ireland. If you love being out in the mountains and want to share your enthusiasm with others, become a Mountain Leader and you’ll never look back. This qualification is all about supervising safe climbing and abseiling sessions on single pitch crags and artificial structures. 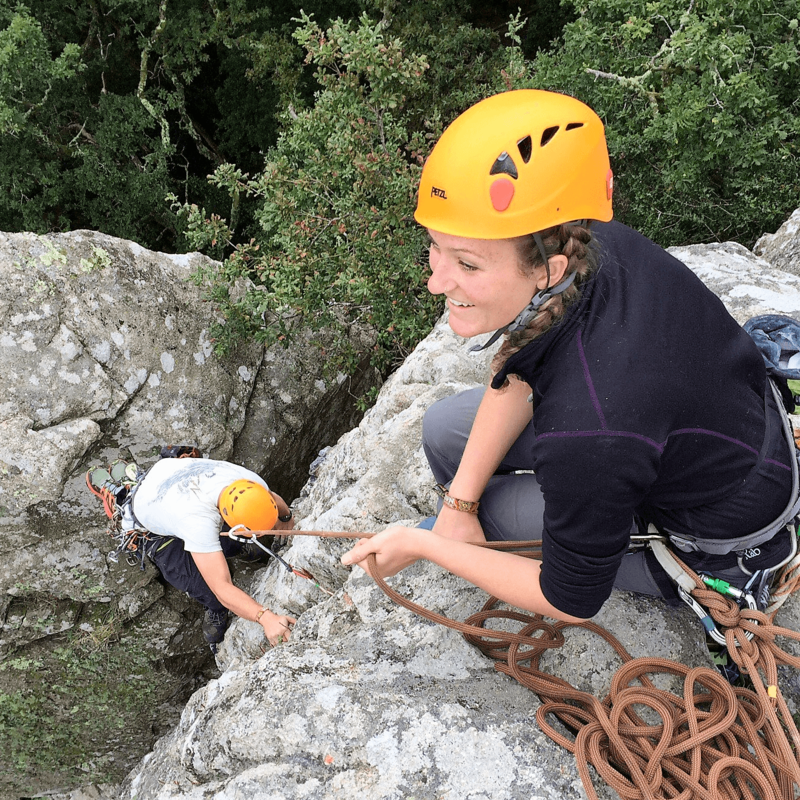 Whether you’re a parent, a volunteer or an outdoor centre instructor, the Rock Climbing Instructor qualification trains and assesses experienced rock climbers to instruct climbing. This qualification used to be called Single Pitch Award which was revised following a review and relaunched under this new name on 2nd April, 2018. We’ve been delivering this qualification course since 2005 and are a popular choice in the South West. Courses are usually based on Dartmoor but elsewhere on request. Please contact us for dates and availability.